Custom Medical Device Mount | ICWUSA.com Inc.
ICW’s versatile Ultra 180 arm customized with a Drop Post supports a Nihon Kohden LifeScope G9 mobile monitor. A major Southern California hospital needed to increase the extension and articulation of a cart-mounted computer workstation and medical device. The hospital used a Mindray A7 Anesthesiology Workstation mounted with a Nihon Kohden LifeScope G9 mobile monitor and a computer workstation. After defining the objectives, Ultra 180 arms and 12” Ultra A1 extension arms were chosen to address the need. These components provided a compact solution with the essential articulation and extension, as well as vertical adjustability. ICW developed the UL180BV-W3-A1-DB2-MW Custom Mount and the NKG9-MW Custom Bracket, and together with a W4-WB Wall Plate, created the Nihon Kohden G9 Custom Mount for the Mindray A7 Anesthesiology Workstation. The computer workstation was mounted on the right side of the Mindray A7 Anesthesiology Workstation using an ICW UL180EV7-W3-KUB-A1 Computer Wall Mount. When not in use, unit stows compactly against the Mindray A7 Anesthesiology Workstation. Vital patient monitoring services can be easily moved to bedside using ICW’s new medical device mount attached to a Mindray A7 Anesthesiology Workstation. 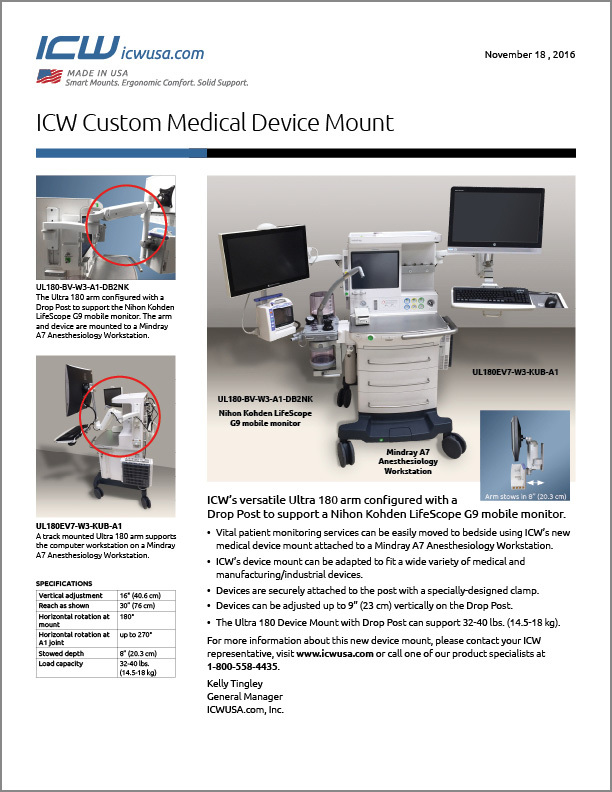 ICW’s device mount can be adapted to fit a wide variety of medical and manufacturing / industrial devices. Devices are securely attached to the post with a specially-designed clamp. Devices can be adjusted up to 9” (23 cm) vertically on the Drop Post. The Ultra 180 Device Mount with Drop Post can support 32-40 lbs. (14.5-18 kg).